When you’re looking for an excellent daycare center in Gilbert, you need to do some homework be observant. To find the best daycare center in Gilbert, you should start your search before you enroll your child and use this list as a guide. If you find a daycare center in Gilbert that meets all of these criteria, then you’ve found a great center. Look for the following when you’re searching through your options. The first thing a preschool in Gilbert should have is an excellent reputation. A good day care center or preschool should feel welcoming and have anurturing environment. You’ll probably want to ask the center for references if they’re available. If they’re not, this isn’t necessarily a deal breaker. For liability and security reasons, some daycare centers won’t reveal confidential information such as the names of the parents who enroll their children. So what do you do? You might want to look at online reviews. Be mindful as well of your own first impression when you visit it, since the best day care centers won’t have to show off. Everything that they are should be right in front of you. 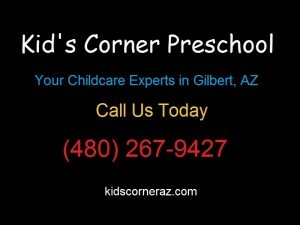 A Gilbert daycare should be flexible. For example, most of the good ones have different times for parents to pick up and drop off their children. Why does this matter? Well, it is simple. If you work 8-5 and the center is open 8-5, you’ll need to make arrangements. With that said, however, your daycare center should have established regulations for everything from their operating hours to how they handle emergencies. The center should be able to provide you with a written copy of these policies so that you know it takes their responsibility and your child seriously. Ultimately, it is a combination of many things that help you to realize that you have found the best daycare in Gilbert.